Attracting new customers costs much more (in fact almost eight times more!) than retaining existing ones, so understanding how to do so can be the difference between business failure and success. Of course, having a great product or service with competitive pricing are fundamental in keeping online customers, but here are five basic pointers aimed at helping you encourage customer loyalty online. Throughout the entire order process, keep your customers up-to-date and informed. A confirmation email, dispatch notification and an accurate delivery day/time are all important. If any mistakes happen or if there are any delays, ensure the customer is kept informed, then correct it promptly. A discount on their next order could help the situation. The web is very impersonal, so take every opportunity to personalise your service. One example could be birthday/event email marketing, creating a customer database with their birthdays, so when it comes to the date you can send a little gift – an offer, discount or freebie. Change the homepage of your website frequently with fresh offerings and news. This reassures customers that your service will be fresh too, and it’s also helps SEO rankings. If a customer has used your services for a long time, let them know how much you value them. It can be annoying for loyal customers if first-time buyers are getting an equal or better offer than they are. For the long run, loyalty programmes are great. Especially if the rewards are unique and personal to each customer. Continually review your service by contacting a selection of customers after delivery, to check that they are satisfied. If not, you can resolve any problems and learn from the mistakes made. Also, contacting customers for valuable feedback on your products and services gives you the opportunity to tell them about your other products and services, or perhaps any current offers. 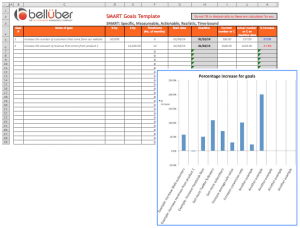 Use this simple spreadsheet template to enter your SMART goals and analyse results. Click here for more info and to download.